Respectability achieved–and rapscallions left behind? Here’s a bit of history. The demands for self-government by the free settlers of New South Wales and the other colonies were largely met when the Imperial Parliament passed the Australian Colonies Government Act of 1850. This authorised the Legislative Councils in the Australian colonies to pass bills establishing themselves as bicameral legislatures. In 1853, proposals were submitted to the Imperial Parliament from the New South Wales Council. After some amendments, the Imperial Parliament passed a Constitutional Statute in 1855, (Imperial Act18 & 19 Vic. No.48 Cap.54). This authorised Her Majesty, Queen Victoria, to assent to a bill passed by the Legislative Council of New South Wales (New South Wales Act 17 Vic. No.41) giving New South Wales a fully responsible system of government, with two Houses of Parliament. It was not, however, fully representative government. The franchise was still property and gender based, with only men able to vote; but it was a very low property qualification and it was a poor man who could not vote. To register, potential voters had to be male adults of over 21 years who owned freehold property of at least 100 pounds per year, or leased property with an annual value of at least 10 pounds per year, or occupied lodgings or rooms with a rent of at least 10 pounds per year or had an income of at least 100 pounds per year. In the nineteenth century, women were not considered capable of making a rational choice at the polls, so were therefore not given the franchise. The property qualification for Members was lowered, but because Members of Parliament still received no salary, only those who were wealthy could afford to run for Parliament. The first New South Wales Parliament established under this new Constitution met on 22 May, 1856. The population of the colony was approximately 300,000. That’s William Whitfield, born 16 Mar 1812 in Cootehill, Drumgoon Parish, Cavan, Ireland and died 12 Oct 1897. He had arrived in Sydney 11 Apr 1826 on the Thames, master Robert Frazer, from Cork, Ireland. By 1856 he was in Picton, NSW. 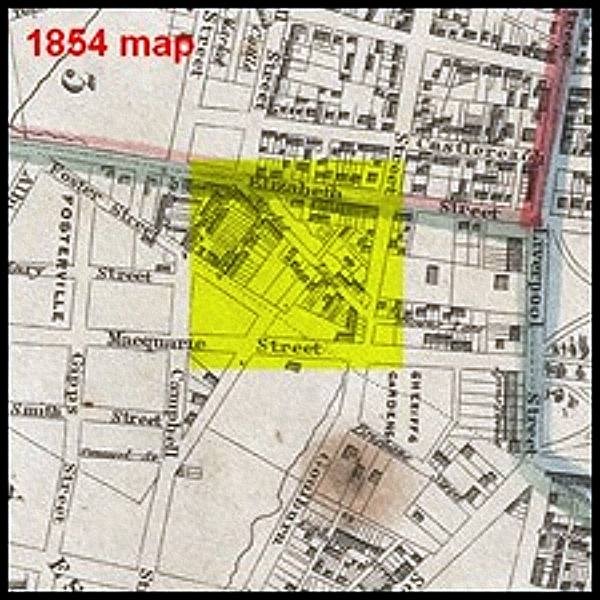 According to this, William and his wife, Caroline Philadelphia WEST, lived in Elizabeth Street from 1836 to 1846. Jacob, we know, had a hut in the area – all of this in that yellow square. Ramana in Pune will be interested in what is on the Elizabeth Street frontage now, as he recently told me in Facebook about going there once! One of the remaining mysteries about Jacob concerns his final years. On Trove I have tracked down the latest mention of him in a case where he wasn’t the defendant! Whilst we can now accept that Jacob died in Sydney, probably between 1851 and 1856 we cannot quite put him to rest until we find an exact date. He was certainly around for a long time. Bit of a villain though, it seems. 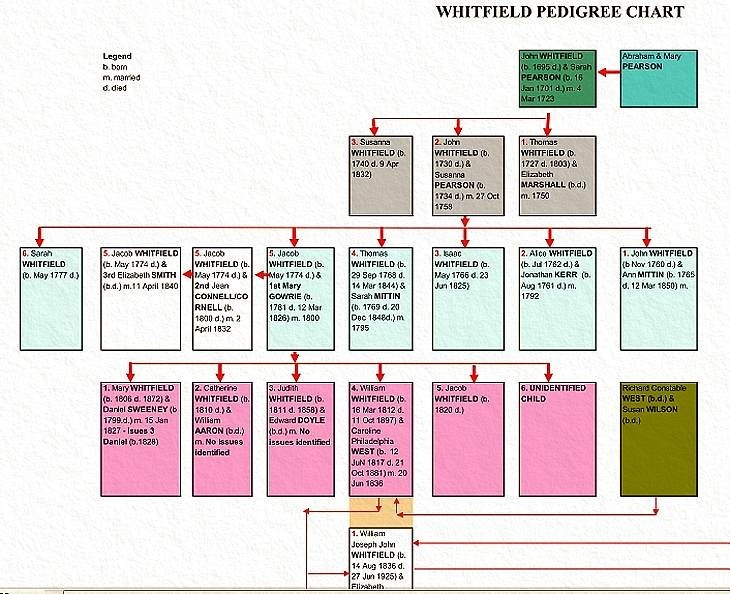 It turns out there is another Whitfield family altogether extant – and with Shire links. The Whitfield family farmed in the Tyne Valley of Northumberland before moving to iron works on the Derwent River in Cumberland where two daughters drowned in separate accidents. Descendants experienced contrasting fates. One, James Whitfield made a fortune on the Australian goldfields before becoming a successful entrepreneur in Workington. His siblings lived and worked in industrial towns and the youngest, William Whitfield became a master mariner in Australia, experiencing a number of misfortunes before returning to Hull, Yorkshire, leaving his Australian family behind. Now that is interesting, because my father used to say his Aunty Jessie and one other family member had traced the family to Hull, and there was allegedly a lost fortune there… That must be this family, but there is no doubt there is no close connection. I suspect OUR Whitfields arrived in Ireland in the 17th century as part of the “plantations”. And as for Jacob? Given the respectability his son William achieved I am beginning to think he was simply left behind when William and Caroline went south. Certainly he was erased from the family memory as I first encountered it in Picton in the 1950s with yet another William Whitfield – Dad’s Uncle Bill. I think I can see why, for several reasons. Sometimes my father would mutter about the Old Testament curse on “the sins of the fathers”… Perhaps too, given what the area they had left behind in Surry Hills had become by 1900, you will see why it didn’t figure in the stories… Anyway, it was not part of my grandparents’ generation’s personal memories. They had become country people. Yesterday they were getting the big screen ready down at Wollongong Mall. Hard to believe it is so long since Sydney, and even harder to believe that I BLOGGED IT! That was such a good time! It is easy to be cynical about the Olympic Games, and much of that is justified. However, I can’t be bothered watching Gruen Sweat either: you can overdose on cynicism. My cousin Beverley. I coached her, you know – in English for the School Certificate. So I have held that gold medal in my hand. Sadly, died of heart failure in 1996. The first thing to come my way was a special edition of Aero Magazine. Now I need to refer you to Closely watched planes 1 and About the Whitfields: loss in my “Specials” archive. 14390 Cpl. Whitfield J. N.
Thus begins a letter from Port Moresby reproduced on the second of those two pages. Now I am not absolutely sure which squadron my father was in, or if as a “carpenter-rigger” – so described in his discharge papers – who appears to have been involved in salvaging bent aircraft – I have seen a file of correspondence with the higher-ups in the RAAF my father was engaged in, including some recommendations of his that seem to have been adopted – he was attached to several. His discharge papers don’t say. One thing I do know is that he rather specialised in Kittyhawks. 82 Squadron seems a possibility. So I was drawn to a photo in that copy of Aero. Now the more I look at the guy in the cockpit the more convinced I am that it is my father! I guess I will never be sure. I met Wing Commander Cresswell — as he became — purely by chance one night at the Sydney Intercontinental Hotel in 1988 and had quite a long conversation with him; but that’s another story. See also FAMILY STORIES 3 — ABOUT THE WHITFIELDS: FROM CONVICT DAYS and the tag “Whitfield” here. Coming back from the war my father (right) determined to build up his own business as a builder and developer, partly in response to the post-war housing shortage and related policies. In the 1930s, Sutherland, like everywhere else in Sydney, suffered the Depression, with many families in trouble and in need of assistance. It was not uncommon to see unemployed people selling flowers along the road to the cemetery. Despite this, Sutherland was the first township to have a baby health centre. The work of Father Thomas Dunlea, Roman Catholic parish priest at Sutherland, was notable at this time. He took in homeless boys and later rented a small cottage in the centre of town to accommodate the growing number. Due to overcrowding and insufficient space, it later moved to Engadine and became the well-known Boys’ Town. In 1939 a railway line from Sutherland to Cronulla was opened and completed the network of links between the shire suburbs with Sutherland as a hub. As Sutherland was so close to the national park, residents used parts of the park closest to the township for recreational purposes. With permission of the Park Trust, an area had been used as a rifle range from 1915, set up primarily by councillors and local businessmen. Over the years other sporting and recreational activities had also been held there. In 1950 due to the housing crisis the rifle range area was used to temporarily house low-income families in a camping ground that operated until 1958. By then housing was more easily obtainable, so the remaining people were moved. The area then became playing fields, known as Waratah Memorial Playing Grounds. The County of Cumberland Planning Scheme was arguably New South Wales’s first attempt at a comprehensive and coordinated town plan for metropolitan Sydney, and, after a short and troubled history, it was ultimately a failure. the extension of the boundaries of the City of Sydney, and the Union of Areas in the County of Cumberland. The second proposal was a most radical innovation in metropolitan governance, in that it created a tier of government intermediate between local and state governments – the Cumberland County Council – to oversee preparation and implementation of metropolitan Sydney’s first statutory plan. The Cumberland County Council was established under the provisions of the Local Government (Town and Country Planning) Amendment Act 1945, which enabled local councils to prepare comprehensive local planning schemes for the first time. The process was overseen by a new Town Planning Branch in the Department of Local Government,with another new creation, the Town and Country Planning Advisory Committee,providing high-level ministerial advice. It drew inspiration from the London plans of Patrick Abercrombie, and introduced land use zoning, suburban employment zones, open space acquisitions, and the idea of a ‘green belt’ for greater Sydney. The Main Roads Department supplied plans for an expressway network. The scheme tied in with the Commonwealth Government’s strategy to prepare for predicted rapid postwar growth, and in June 1947 the Cumberland County Council was inaugurated by state parliament, to prepare ‘for the guidance and control of growth in the County’ – ultimately the future direction of growth for metropolitan Sydney. Comfort Homes eh! I had forgotten that business name, but the front room at 61 Auburn Street was the office and Mum the receptionist. It was a mixed success, as by 1951 dad was back working with C S Boyne, a Real Estate Agent in Beverly Hills and a relative of my mother’s mother’s family. In due course in the 50s he had a semi-independent enclave in another Beverly Hills agency, Sproule’s. By the later 1950s he was independent again at Jannali and Sutherland. Sometimes the business prospered mightily, sometimes it didn’t. I’m afraid I took as little interest in it as possible! Bread delivery, Sutherland in the 1920s. Same thing and maybe same cart was in Auburn Street in the 1940s – along with the milko and the ice man. 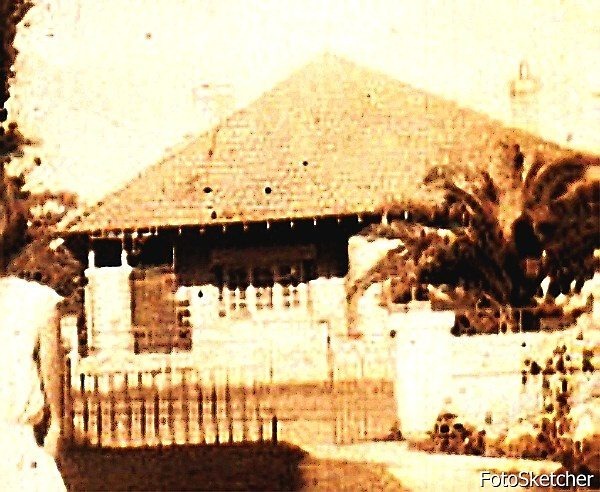 Mail delivery in Jannali in the 1950s.